Good morning! I hope all of you are enjoying the weekend! I know I am! Christmas plans are in full swing, the cards have been mailed out and now on to decorating! We're also in the Christmas mood over at Dream Valley! This time however we would like to see your NON-TRADITIONAL Christmas cards. I inked the pink circle with a mask and sponges and then used the reverse of the mask to cover it and stamp the snowflakes. Next step was to stamp the image and sentiment in black. 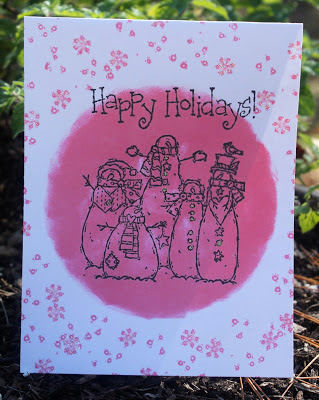 A clean and simple card, in pink! Come on over to play at Dream Valley and you could be the winner of 4 images of your choice from our sponsor Meljen's Designs! Even with non-traditional colors your card definitely has got plenty of Christmas feel to it! Lovely one layer card! I love your pink card! What a lovely image, how good it looks in black outling against the gorgeous pink!